My brand is adventurous, feminine portraiture. I create an experience you will cherish for a lifetime, not just photos you get to share on social media (that's only a bonus)! What I offer is a celebrity-style photoshoot experience with fully styled hair, makeup, and clothing however you want to be photographed, wherever and whoever you want to be photographed with. - addictive, transformative, and highly inspirational. Before your session we will plan and design a photo shoot that you want–that you’ve dreamed of. 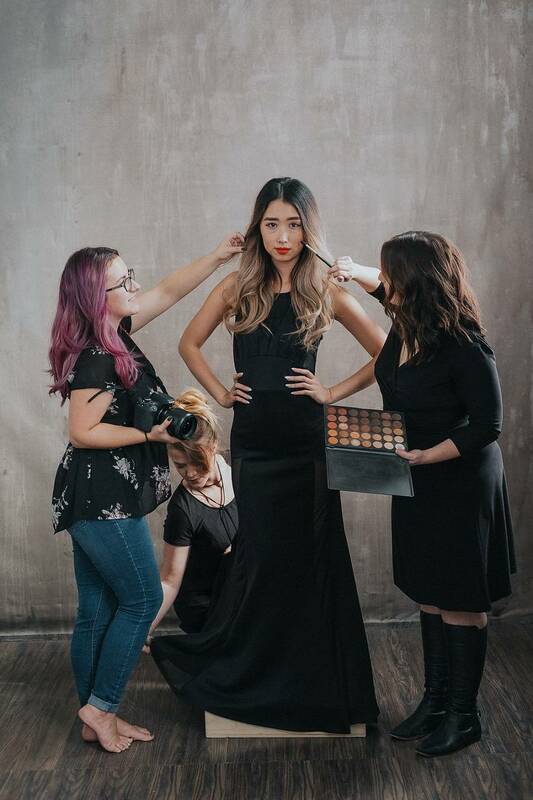 My team of professional makeup artists and hair stylists will give you a full makeover and give you any level of glam that you envision. We have you bring up to five outfits for your photoshoot and help you style them. And, if you do not have five outfits to wear, during the consultation we can style a wardrobe for you from what we offer in our studio. We can also help you find outfits to rent or buy online. We will spend 2 – 6 hours together having fun, changing outfits and going on different locations ensuring you have the best selection of images to choose from! Following your portrait session is your reveal. You will be able to come back to my studio and see your photos and choose your favorites. You can purchase an album and fill it with your favorite images. Choose wall portrait enlargements, or any combination of the two. What you buy is entirely up to you. There is no minimum purchase required. My job is simply to take the most beautiful portraits you have ever seen of yourself that you will want to buy them all! There is little value in your portraiture investment unless you have something tangible at its conclusion to enjoy. A printed piece that lives permanently in your home will be cherished for generations to come. My mission is to help you create something not only tangible for your home, but also deeply moving for you and for your dear ones to love and adore as the years pass. There’s a reason you chose to invest in professional portraiture. I plan to ensure that reason resonates in your heart each and every day, and that your printed portrait art does nothing but grow in sentimental value as your life changes, and as time rapidly rushes by. Nothing brings me more joy than using photography experience to spark self love and self confidence in my clients. For some of my clients this is once in a lifetime experience and some keep coming back every 6 months for more, and either way I will give my all to create images that will speak to you and remind you of a badass you truly are! Portrait experience comes with professional makeover, 3h session at multiple locations, access to studio wardrobe and fun time drinking mimosas and listening some great music. Session fee is $250. Products and digital files are purchased separately at your ordering appointment. Wall art starts at $290, albums at $595 and average investment clients make is $800-$1500 based on the products they fall in love with. What kind of sessions you photograph? Do I need to choose which products I want before the shoot? Is there a minimum purchase requirement and how much it costs? Can I get digital files of the images? I specialize in female portraiture and focus on embracing and showcasing your inner beauty. Maternity sessions, Mommy & Me, Breastfeeding sessions, Senior, Boudoir, Fashion, Dance, Headshots and more!